The matter will come before the High Court again tomorrow. BUSINESSMAN DENIS O’BRIEN is seeking an injunction to stop RTÉ airing a story about his private banking details. The matter will appear before Mr Justice Paul Gilligan in the High Court tomorrow morning, after two envelopes were handed in to the court today. Sources say that the news story, which comes from RTÉ’s News and Current Affairs unit, was due to air tomorrow, but had been moved to early next week. RTÉ reports that the High Court was told the report will give details of O’Brien’s private banking, but at no point is it suggested that there is any wrongdoing that would be in the public interest. A second letter refers to money O’Brien owed to IBRC. Counsel for O’Brien said that all of the details were related to personal banking and would be “undoubtedly confidential”. Mr Justice Gilligan told O’Brien’s legal team to serve the papers on RTÉ immediately. 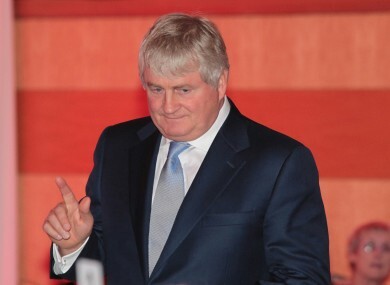 Email “Denis O'Brien wants an injunction to stop RTÉ airing a story about him”. Feedback on “Denis O'Brien wants an injunction to stop RTÉ airing a story about him”.